This thread shows some pictures and text that will act as instructions for the Vorshlag LS1 swap Drivetrain mounts we make for the Scion FR-S, Subaru BRZ and Toyota 86 chassis. The picture above shows our Engine + Transmission mount kit for use with any LS series engine (GenIII-GenIV LS1/Ls2/LS3/truck/etc engines) along with the Tremec T56 Magnum XL 6 speed manual. 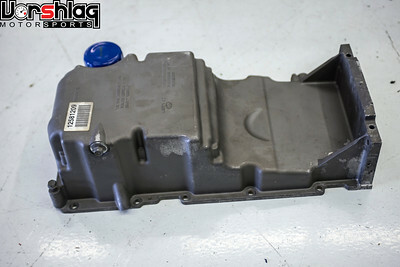 We do not make a kit to use any other transmission model at this time. The 86 chassis transmission is held in with a small crossmember, which is visible on our Alpha customer's FR-S (with an aftermarket turbo) shown below. 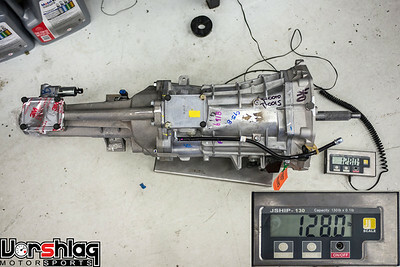 The first step to do this part of the swap is to remove the FA20 engine and factory 6-speed manual, as shown below. 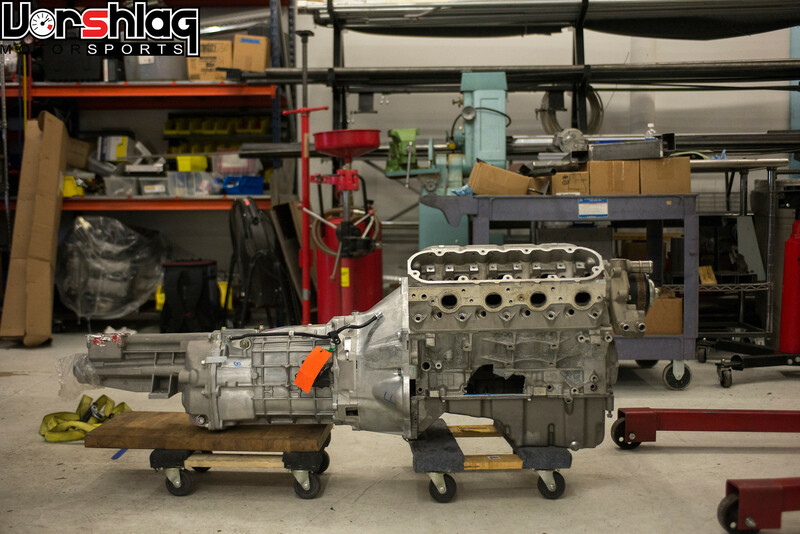 You can see that the transmission length on the factory transmission is VERY long, which is partly why we need to use the T56 Magnum XL transmission - which itself is 5.5" longer than the T56 Magnum design. 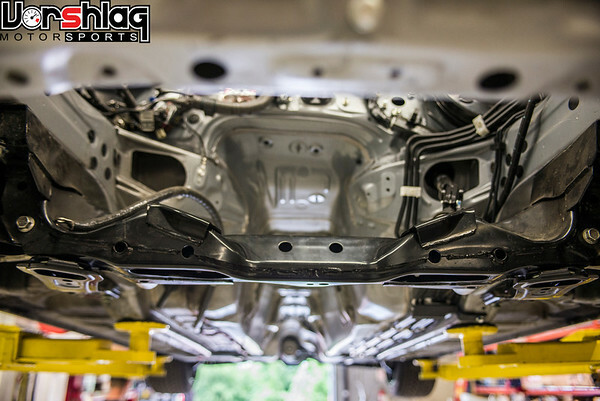 Looking from the engine bay down into the trans tunnel you can see the sheet metal bracket that the OEM trans crossmember bolts to. Its too narrow and must be removed. 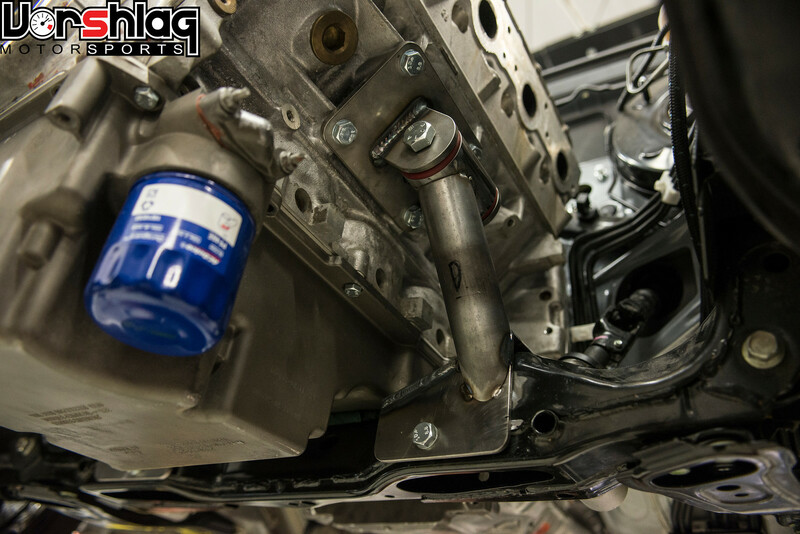 We tried to test fit the T56 Magnum XL with this bracket in place, as shown above. The OEM tunnel bracket simply prevented the transmission from going high enough in the tunnel, which would have caused serious ground clearance issues. Above left is a T56 Magnum XL is attached to a generic LS engine with the 1998-2002 Camaro bellhousing above. 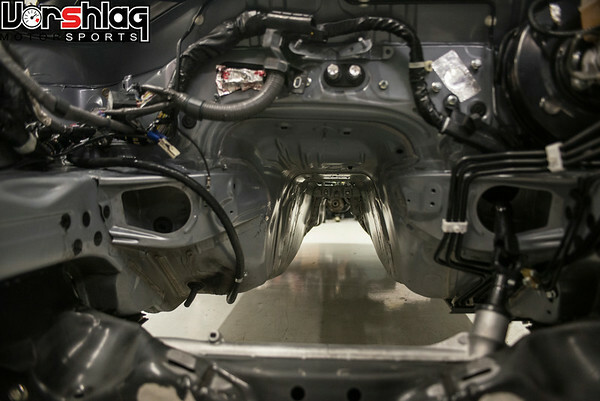 This is what our kit is built around - not anything else - so don't buy our kit if you are using some other transmission or engine or chassis. 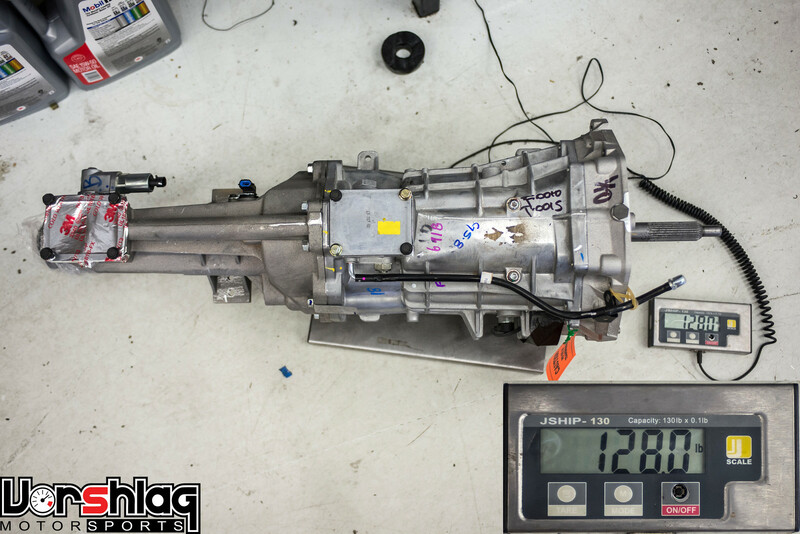 You won't find this transmission for sale used (it was never installed in any factory car), and its even tricky to get them new for use with GM engines - call Vorshlag and we can supply this at a good price for you. 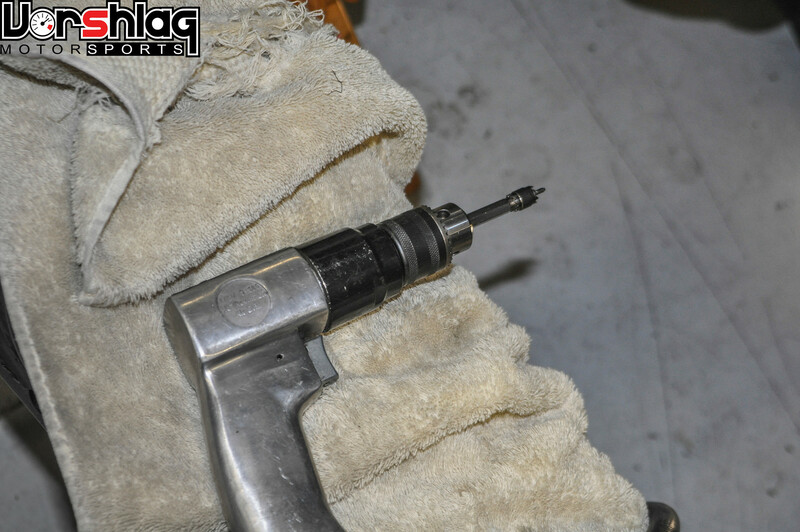 you will want to get a good set of spot weld cutting tools, like this unit shown above. This kit has a small hole cutter aruond a spring loaded pointer. 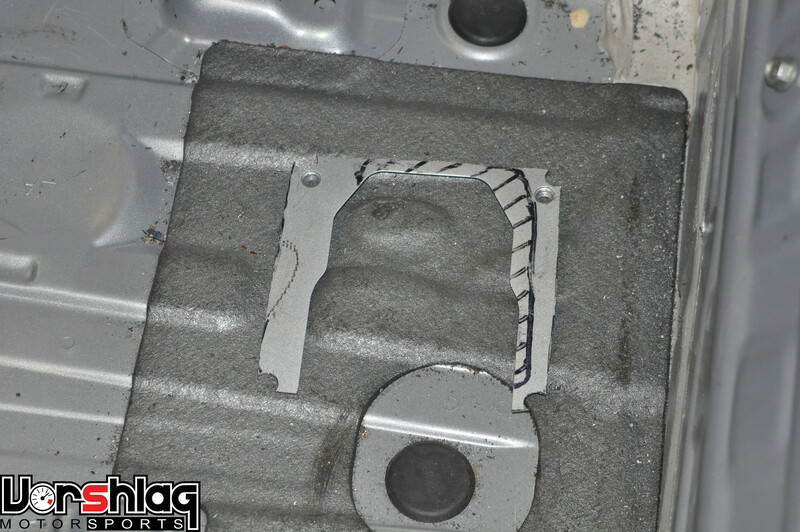 What you do is find the spot welds, use a drill punch to mark the center of the weld with a small dimple. 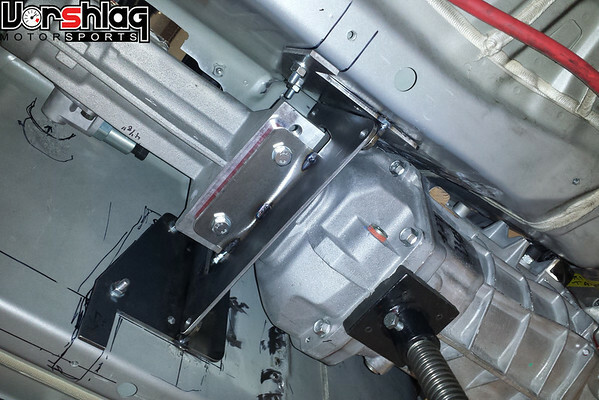 Then use line up the spot weld cutter on the dimple and use pressure to cut through the outer layer of sheet metal. DON'T DRILL ALL THE WAY THROUGH THE FLOOR! This takes patience and a little skill, but is relatively easy. 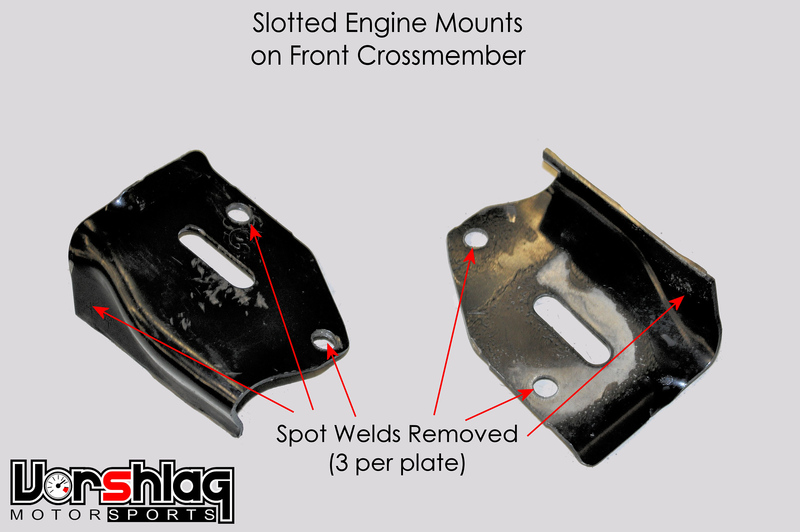 Once you have ALL of the spot welds cut the bracket should be fairly easy to remove. 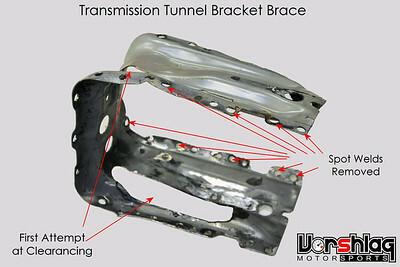 This is what the tunnel should look like with the forward-most bracket removed. Much more "width" to house the bigger and stronger T56 Magnum XL. The image above shows approximately the size of the piece of the top of the tunnel that needs to be removed to clear the shifter section of the T56 Magnum XL tailhousing. The direct mounted shifter will poke through this hole into the cabin, as shown above. 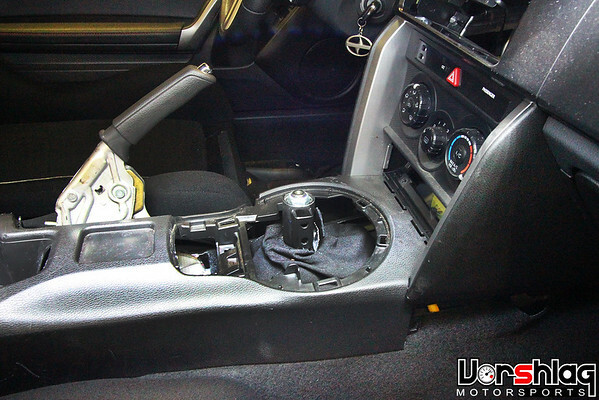 We will try to make a template to send to our customers to help locate and show the shape needed when trimming the top of tunnel for the shifter. 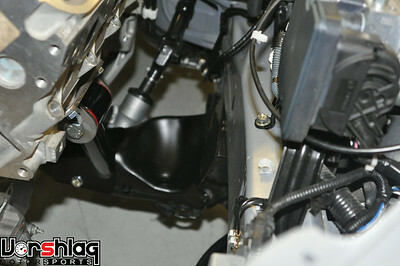 The image above shows the prototype transmission crossmember assembled and bolted into the car. The production version has two tabs that "key" off the to M6 threaded holes visible in the picture above. To mount the side brackets you need to drill several holes through the tunnel and bolt through the tunnel. 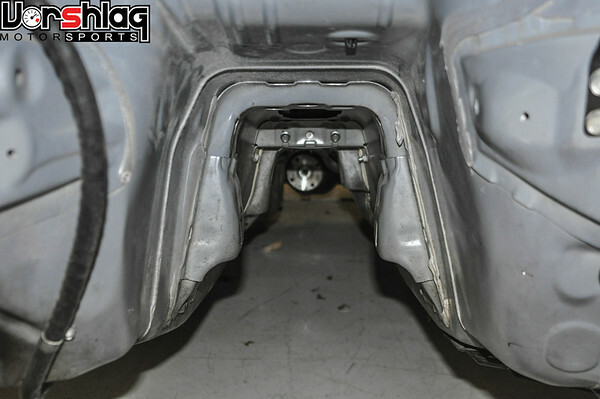 You can see the large washers for the 4 bolts per side that pass through the tunnel in the picture above. 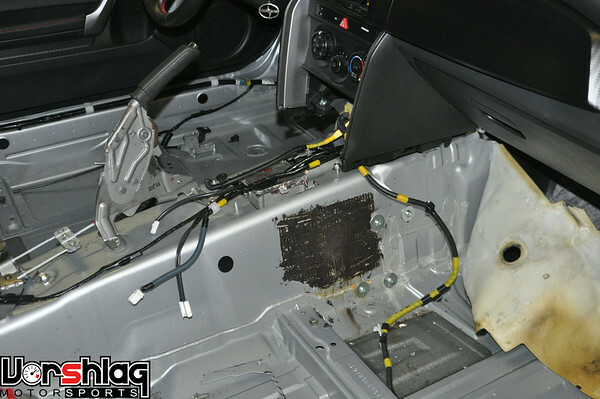 The carpet has been removed from this car to show the location of the bolts, but the carpet can be put back over these bolts to cover them up. 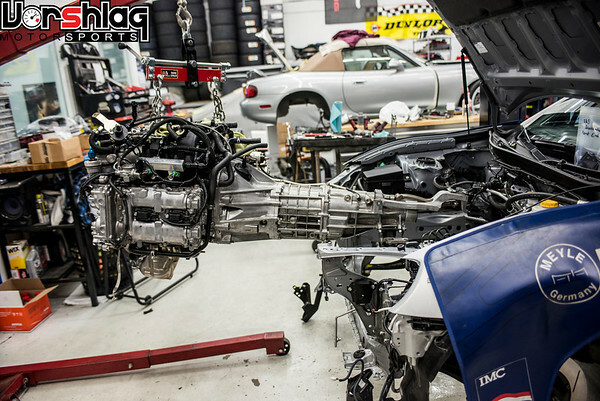 This is what the transmission looks like with the production style bracket assembly bolted to the car and to the transmission. 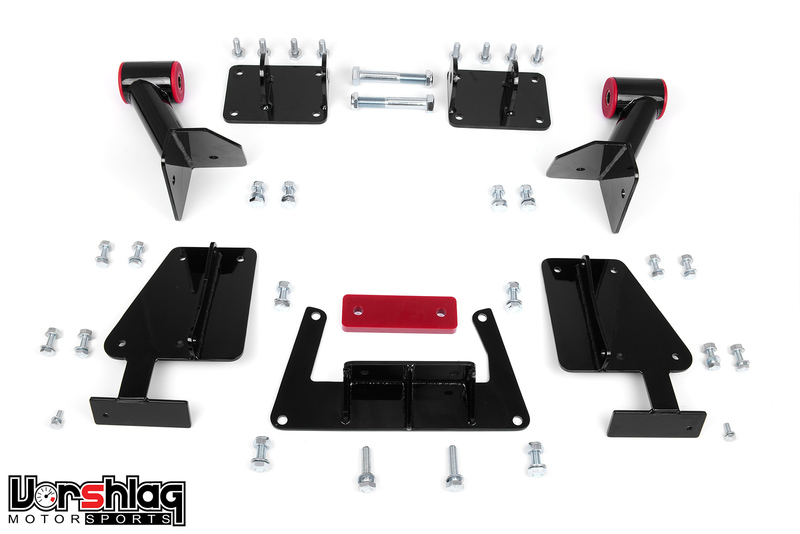 The red polyurethane bushing provided with the kit is placed between the new crossmember and the T56 Magnum XL. 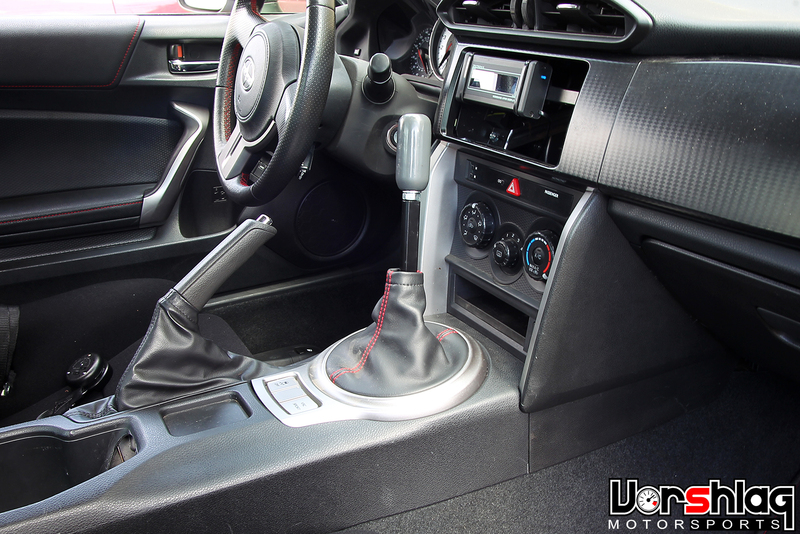 With a custom "long" shift handle and knob (which we built for this customer) installed above the shifter location is complete. There was no need for an offset shifter for this swap - any off the shelf shifter for the T56 Magnum will work. Last edited by Fair! ; 03-22-2017 at 09:09 AM. 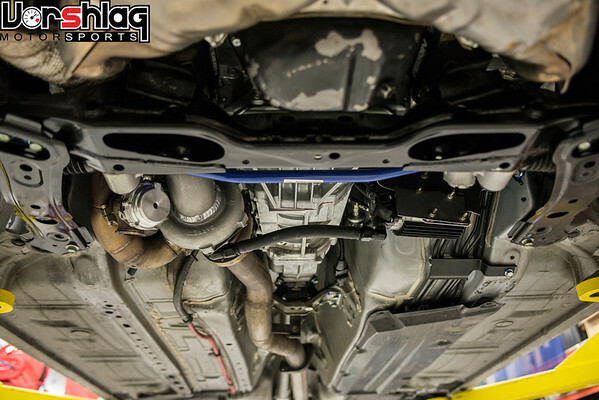 Now that you have completed the most difficult changes to the car to fit this V8 and T56 Magnum XL, lets move onto the easier bit - the changes needed to fit the Vorshlag LS swap motor mounts. We built this kit to work with any LS series engine (if you don't know what that is.... well, you are in way over your head) using the GTO oil pan, shown below. The LS1/LS2 GTO oil pan is an unusual "front sump" design that is different from virtually all other factory oil pans for LS engines. 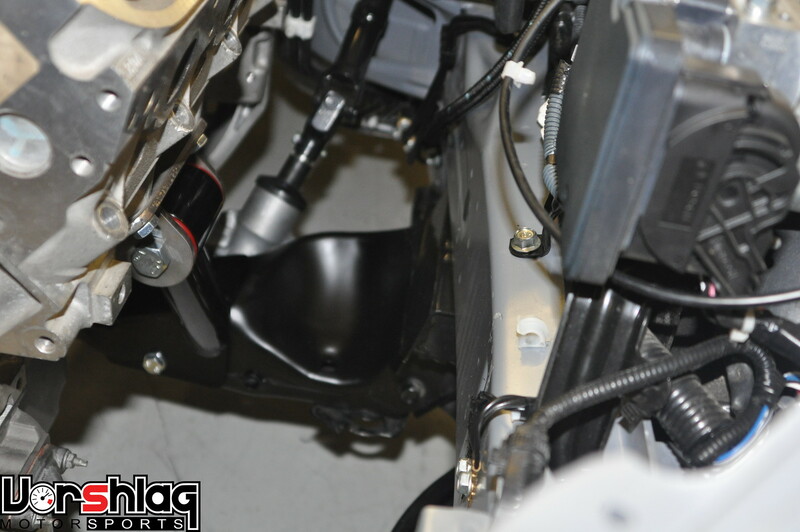 You can see how it is re-routing the oil path for the front mounted filter in the picture to the above right. The image above shows the LS1 with the GTO oil pan in place on this 86 chassis, which puts the deeper "sump" section ahead of the stock engine crossmember or "K-member". 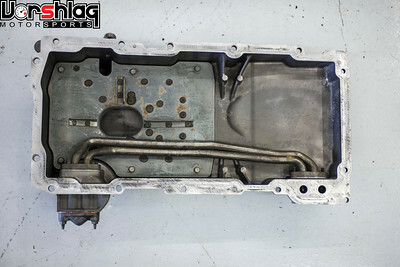 The factory 86 engine crossmember has to plate steel "pads" that need to be removed to fit the Vorshlag motor mounts. these pads are visible above. Break out the spot weld cutter again and get to it. 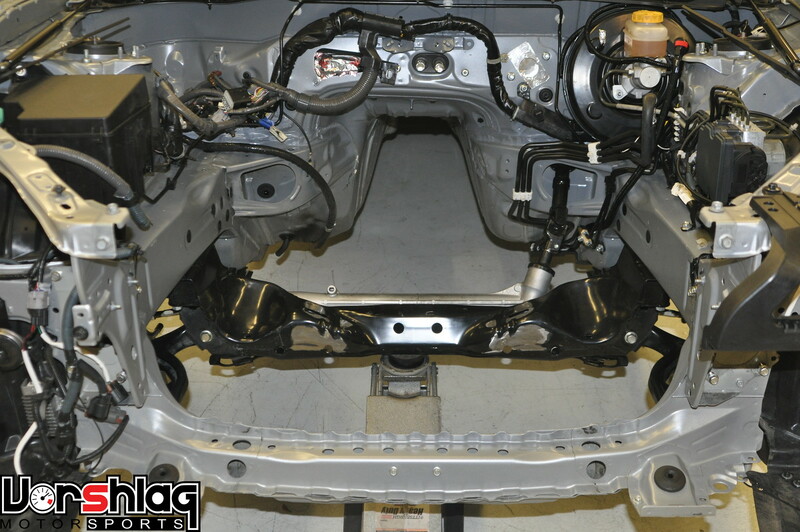 The OEM plates are removed above and you can see where the spot welds were located. We cut through the top two and pried the plates off, as the 3rd spot weld is hard to locate. The modified crossmember is shown above with the "pad" removed on that side. Now is a good time to clean and re-paint this section to prevent rust. Here's a shot showing both sides of the modified crossmember. 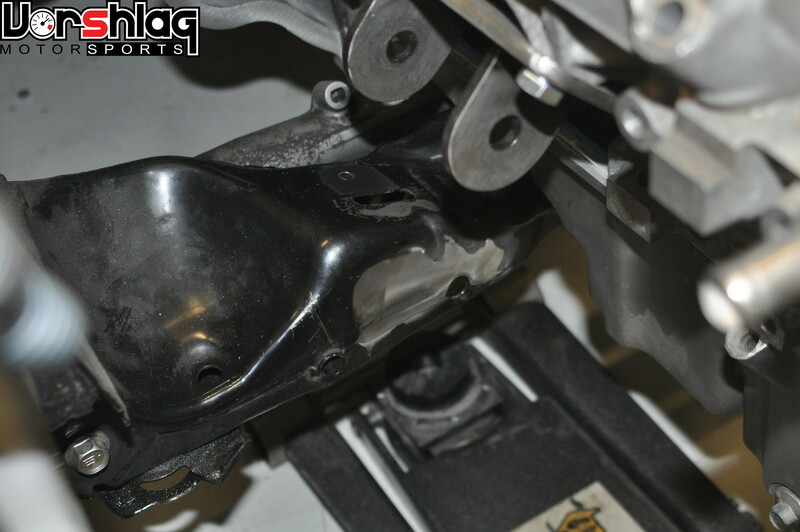 the two shiny silver spots are where the pads were removed. 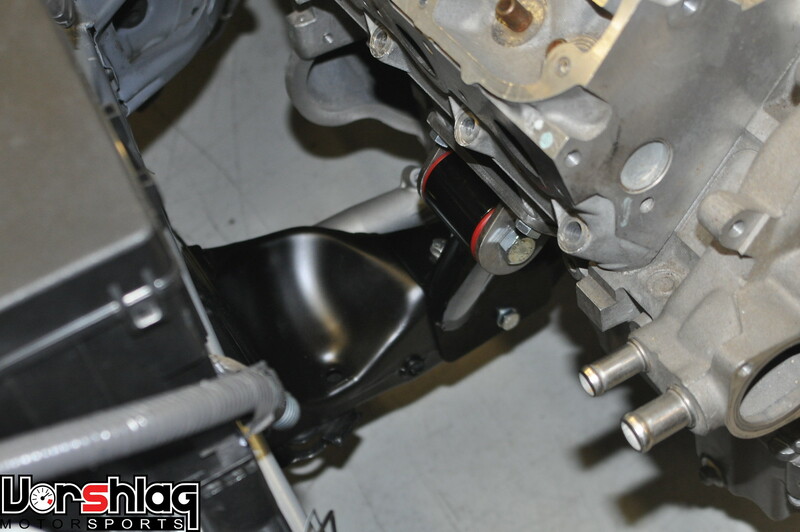 With the oddly shaped pad removed the Vorshlag motor mount is easy to align and bolt in place, as shown above (prototype mounts - production versions are powder coated black). 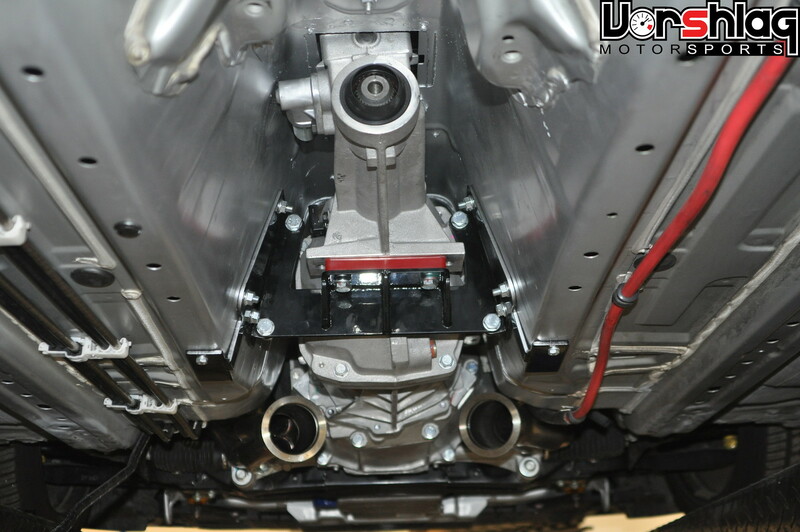 The pictures above show both motor mounts bolted in place on the freshly painted crossmember. This kit only works on the Left Hand Drive 86 chassis. We have no plans to develop a RHD version at this time. 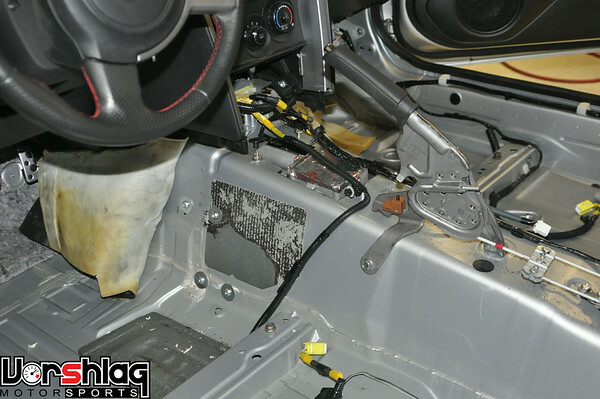 These first two posts show how to get the LS engine and T56 Magnum XL transmission in the 86 chassis using the Vorshlag LS Swap Drivetrain kit. 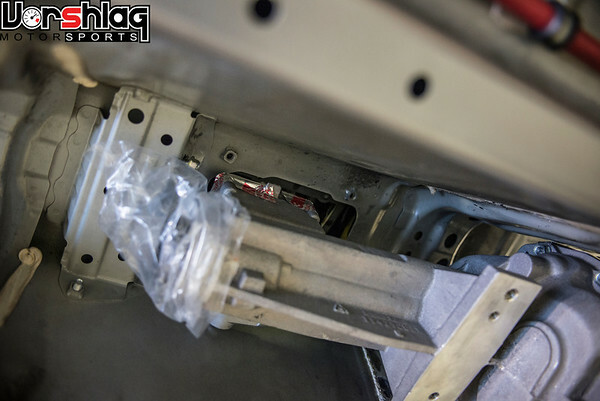 We will post additional threads with more instructions soon to show the installation of our long tube headers, driveshaft, and other products we make for this chassis. Last edited by Fair! ; 03-21-2017 at 08:46 PM.